This summer (2018) I plan to work in Norway photographing Palestinian refugees and in the autunn of this year enter Gaza with a group teaching nonviolent methods of resolving conflict and to continue my series there. You can support my project either thru my PayPal site. Based on my spring 2015 three-month journey of faith in action, I show and discuss my photographs about coexistence, Palestinians in Jerusalem, the Freedom Bus Ride thru the West Bank, Gaza’s Israeli neighbors, the hydropolitics of the Jordan River and Dead Sea, and other topics. 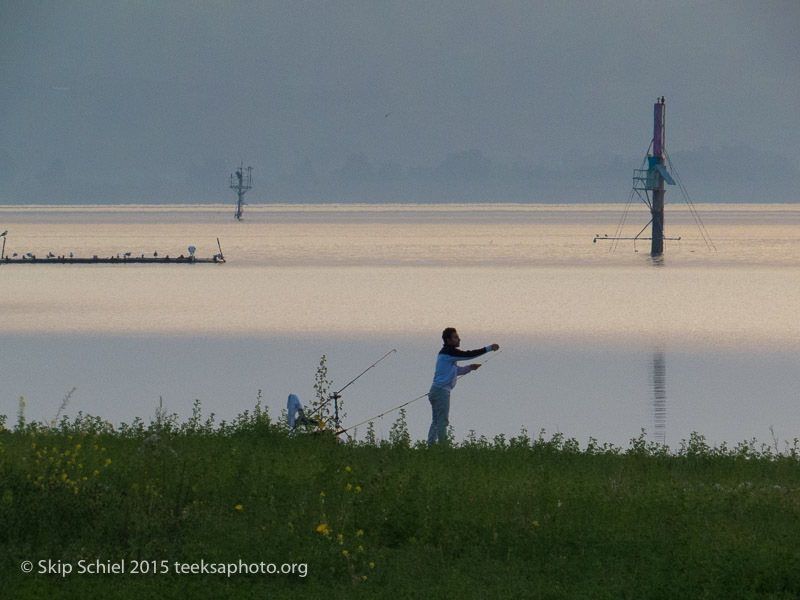 Website: teeksaphoto.org. A slideshow about the annual celebration of Jerusalem's "reunification." In reality, Jerusalem is not unified, but in the eyes of many of its Palestinian residents it is occupied. Violence in this holy city has recently escalated. All governments refuse to locate their embassies there, but instead base in Tel Aviv. The march provocatively begins in Sheik Jarrah, a contested Palestinian neighborhood, marches thru the eastern, largely Palestinian sector of Jerusalem, thru the Damascus Gate, and into the Muslim Quarter to the Western Wall. I photographed and videoed this year's March, trying to carefully depict both sides of the controversy. I accompany the short movie with a slideshow about Jerusalem from a Palestinian perspective. A photographic exhibitio and slideshow. An inclusive history in slideshow format from the First Zionist Conference in 1897 to the present, with special emphasis on the contemporary period, narrated by Skip Schiel from his personal experiences over the past 13 years of trips to the region. 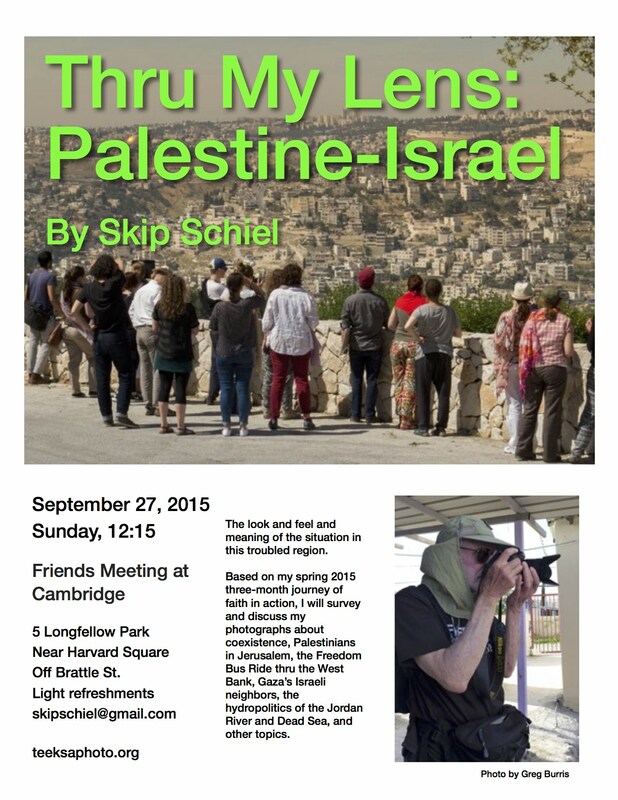 The look, feel and meaning of the situation in this troubled region.A photographic presentation based on my 2015 three-month journey of faith in action, I will show and discuss my photographs about coexistence, Palestinians in Jerusalem, nonviolent resistance to the occupation in the West Bank, and other topics. Based on my recent three-month journey of faith in action, I will show and discuss my photographs about coexistence, Palestinians in Jerusalem, nonviolent resistance to the occupation in the West Bank, and other topics. A slideshow by Skip Schiel about Palestinians under occupation practicing exemplary strategic nonviolent resistance. The renowned Freedom Theater of Jenin in the West Bank organized a two week bus journey inspired by the Freedom Movement and Bus Rides in the United States. 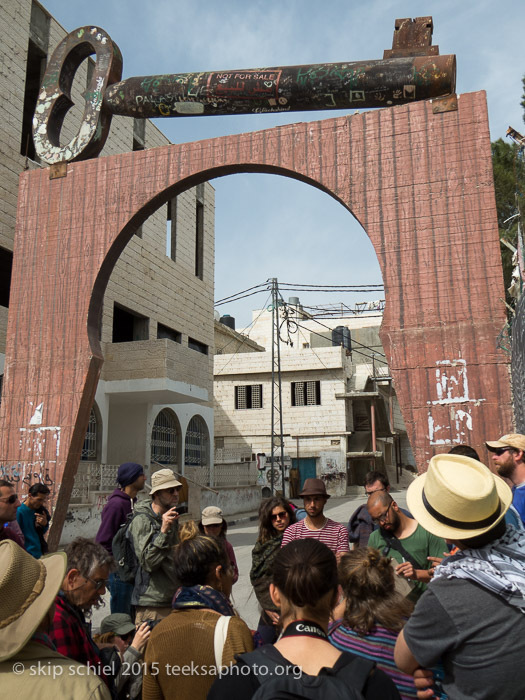 Last spring some 60 international and Palestinian riders explored some of the most attacked and resilient communities in the West Bank—Bil’in, Tuwani, Nabi Salih, the Jordan Valley, and Jerusalem itself, known by thousands for their creative struggles against oppression. 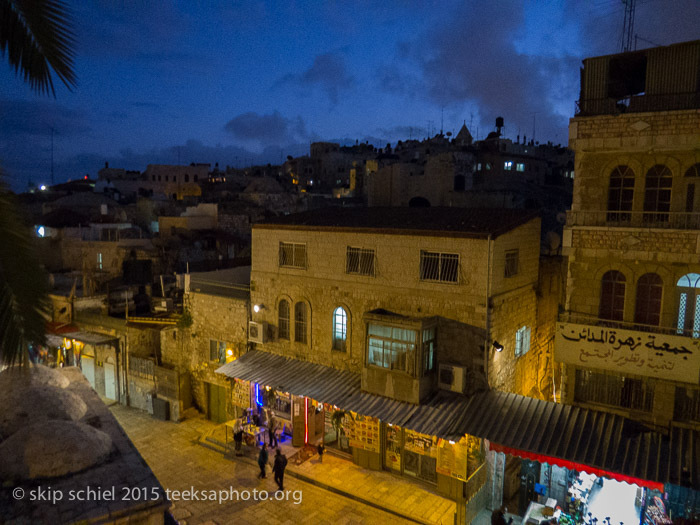 A slideshow by Skip Schiel about the annual celebration of Jerusalem's "reunification." In reality, Jerusalem is not unified, but in the eyes of many of its Palestinian residents, it is occupied. All governments refuse to locate their embassies there, but instead base in Tel Aviv. The march provocatively begins in Sheik Jarrah, a contested Palestinian neighborhood, marches thru the eastern, largely Palestinian sector of Jerusalem, thru the Damascus Gate, and into the Muslim Quarter to the Western Wall. I photographed and videoed this year's march, trying to carefully depict both sides of the controversy. A movie by Skip Schiel about courageous Israelis advocating for talks, not tanks, diplomacy, not war. Living within two miles of Gaza, these Israelis suffer the brunt of rocket and mortar attacks from Gaza, most recently infiltration as well. Yet they call for an intelligent response to the violence in their neighborhood, in league with similarly minded Gazans. Skip will outline his work in the region since 2003, highlight Quaker and American Friends Service Committee projects there since 1869, and describe his upcoming trip. He will sell his photos, movie ("Eyewitness Gaza" about his work in the region), and photographic book (also titled "Eyewitness Gaza"). He expects to leave for the region in early March for 3 months to continue making photos that show conditions and struggles for justice, peace, security and reconciliation. In particular, he will coordinate with his Quaker Meeting's efforts to respond to the situation in Palestine-Israel. Skip will also be presenting for two classes at Tiffin University on March 24, and one or two other private venues. By the Waters of Babylon, a talk and slide show by Minga Claggett-Borne and Jonathan Vogel-Borne about their recent trip to Israel Palestine with Christian Peacemakers Teams. This is a closed presentation to the school. At Temple Sukkat Shalom at the corner of Cordova St. and Foster Ave. Sponsored by the Center for Peace and Justice and the Religious Studies Department. Along the Mediterranean Coast: New Photos from Gaza & Jaffa-Tel Aviv Oct 1, Saturday, all day 10 am - 4 2062 Greenwich Rd.